Have you ever been challenged to take a step in life that scared you? Five years ago I decided to do something different. Although I had already been blogging since 2005, I felt like I should start a different type of website than I ever had before, one dedicated to helping others in my world find ways to connect with something bigger than themselves. There were multiple reasons I was scared of this. For one, most of my writing before was very personal, like a journal. And, honestly, although I had a lot to say, I wasn’t a very good writer–if you think my posts are long now, read one from then! I was also scared of the technical aspect because before I had always used easy platforms and nothing complicated. This time I was using something much more complicated, which required me to learn skills that I am now I am grateful I have. But most importantly, I was scared because I wanted something to happen just because I wrote. I wanted to influence others towards something worthy in one of the few ways I actually could give. I was challenged to answer the question of why I am a humanitarian blogger for this month’s World Help post. This seemed like it would be easy for me, as that was the whole essence of Average Advocate–my branding. But the more I’ve thought about it, the more I recognize being a humanitarian blogger as what I originally envisioned is not what I’ve become. I am okay with that, as I like what I am now so much more. Have you ever felt so much tension you couldn’t not do something? After feeling frustrated for most of five years, living in the richest county in the United States, and having motherhood thrown on me, I was stuck in some muck. (You liked that cheesy rhyme didn’t you? Admit it. You almost chuckled.) I was a walking bucket of tension because of the indifference of those around me vs. the horrifying, heartbreaking reality the larger portion of our world lives in–the extreme poverty, disease and oppression that I had seen first hand and studied in college. The gross disproportion made me crazy. And I couldn’t do anything over there as I was suburbs-muck-stuck. But then I read Bill Hybels’ Holy Discontent and something shifted–I realized I was more horrified by my fellow Americans’ indifference than I was by global suffering itself (you can read more about that in my post What to Do with That Blasted Holy Discontent). Here I had a perfect opportunity to focus on inspiring everyone around me to care about the world at large. After all, even if I was living overseas, I couldn’t manage more than one orphanage, one medical clinic, one school, one human trafficking safe house, one ______. I couldn’t do everything! But if I mentored and helped those around me find their callings, maybe, just maybe, I would help 200 people start orphanages. Maybe this should be obvious, as I was advocating already, but until then I was advocating as a space-filler until I could do something more meaningful (as I perceived it). But with this focal-shift I could still change the world from where I was! And on one front, this would include my writing and blogging, which I had been studying how to carryout better. A little shaky, I took the next step of starting the Average Advocate. Have you ever begun with expectations but it saw but saw your plans unfold in a totally different way? The above story might be why I became a humanitarian blogger, but it doesn’t really distinguish how being one went differently than I had planned. I had started with a vision for many people to hear what I had to say. I hoped to be a website were collective individuals could meet and be inspired, maybe then shift to become like a humanitarian magazine or social sharing site, full of countless ideas and act as a hub of advocacy. I should note, that there were very few websites doing anything like this five years ago–most of them were just the blogs of specific organizations, not websites focusing on working with many organizations. Now there are many dedicated to doing just that, and do so excellently, inspiring collective millions of people to take next steps that change the world. Obviously, the Average Advocate didn’t become what I thought it could be. First, although I had a good niche topic, most people aren’t really that interested in it. Why would you follow a blog on advocacy if you didn’t care about advocacy in the first place? Most people get sucked into caring for global issues by other things, almost always through a friend or famous person, challenging them forward. So, considering the above (and other reasons), I didn’t become famous. So what happened instead? Simply, I moved the struggle I was having–dealing with my tension, wanting to change the world–to a public space, online. How can I be more loving? Can I express why I think we should care? Will others join me if I step out to try this? Would you like to see my list of action ideas? Would people want to help me raise money? Can I tell people why I support these organizations? Would you be interested in knowing how I do this as a mom/wife? How can we change the world in the midst of this current event? Instead of having the answers, I became a transparent experiment. The Average Advocate might have been started to help others become inspired to advocacy, but instead it became a living storyboard of an advocate’s journey–my journey. And, it turns out, that actually does inspire people. I might not be famous, but the Average Advocate has had an undeniable impact. Maybe surprisingly only to me, I also became a much better advocate. I learned what works and what doesn’t. I learned that it is worth it to take a bold step, because months, but usually years later, someone was watching and that someone will follow. I learned that my online presence really just bolsters my real-life relationships. And I learned that who I am isn’t defined by what I do–the visible result doesn’t determine my worth and value as a person (check out this post, My Book Guru–With: Reimagining the Way I’ve Related to God Part 1, where I begin to talk about this more). But most importantly, I finally understood that being an advocate isn’t synonymous with being a world changer. Just getting good done–even copious amounts of good–while being driven by a savior complex and being chocked-full of identity issues, while that might have impact, is it really transforming our world in a sustaining way? 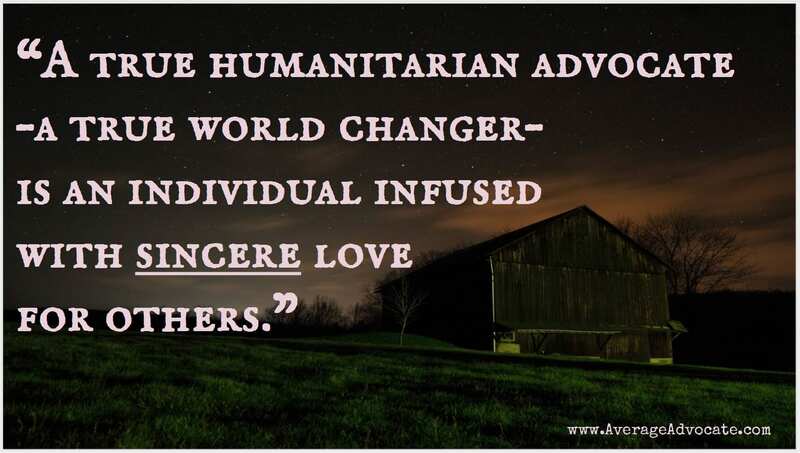 A true humanitarian advocate–a true world changer–(and in this case, a humanitarian blogger) is an individual infused with sincere love for others. Because if you want to save the starving African children, but have not love, you might save them. But you were not transformed by love. My fear is that we might make a world with no more extreme poverty and no more oppression, but it won’t last through the next generation because none of us ever truly learned the art of love, which propels this. We just learned what was culturally intolerable at the time. As we are humanitarian bloggers, advocates, activists, or simply normal people just trying to do some good, let’s evaluate if we are really motivated by love. Otherwise, according to the above passage, we are nothing and we gain nothing. I don’t want to be an advocate that does a bunch of good, but just pretends to love. I don’t want to miss out on my own transformation, which might actually be just as important as the good I do. That is really hard for me to admit, and in general, a challenge for all of us who are others-centered to come to terms with. But if we are as valuable as the ones we are trying to “rescue,” then it must be true that our own development is just as important. Have you ever looked back on something unexpected and saw something to celebrate? So, on this five-year anniversary of the Average Advocate, I can say with confidence that I like this place. I like who I have become through it–not just doling out facts and directions on how to change the world, but someone who is learning how to really love people (usually my fellow Americans who used to make me crazy). I hope as I continue blogging here that you join with me in your own journey–that by hearing my story it will help you process your own tension, step into your own passions, and make a difference that touches the corners of the world. Most of all, I dream that we will be transformed as we learn the art of advocacy–that particular art of really, sincerely loving others. Did this post inspire you? If so, consider sharing this image on Facebook, Twitter, Pinterest, or whatever your vice is to keep the momentum going. Thanks!